After a sluggish end to 2018, the start of 2019 has been fabulous for most investment markets. Record corporate profits, strong U.S. economic numbers, optimism about trade negotiations, and a potentially more accommodative Federal Reserve policy have all boosted market prices in the last quarter despite concerns about global economic growth. In the U.S., both large and small company stock prices have largely recovered from the late 2018 downturn. The S&P 500 index, which tracks large U.S. companies, has risen 13.1 percent in 2019. It is now about 3.8 percent below its highest price over the last 52 weeks, which was reached last September just before the October market correction. Price-to-earnings ratios are now equal to long-term averages. Small U.S. company stocks have recovered, but they declined more sharply last quarter than large U.S. company stocks. The Russell 2000 index has seen a robust recovery this year. It is roughly 12 percent below its 52-week high price reached last fall. Most international markets have also been rallying so far in 2019 after a tougher 2018 than was seen in U.S. markets. Global trade renegotiations and slowing global growth have hurt international markets. The worry and lack of certainty regarding possible trade agreements have caused foreign stocks to decrease. These worries may have created value and buying opportunities during the first quarter. In Europe, the Stoxx 600 index is up 13.6 percent in the first quarter after a year in which European markets saw their worst decline since 2008. However, there is continued uncertainty surrounding the U.K.’s departure from the European Union that we believe has limited the rally. The U.K.’s Prime Minister Theresa May, who originally campaigned against Brexit, has so far been unable to negotiate a deal that can make it through the British Parliament. U.S. and China trade deal optimism has helped the global rally. There are no notable developments, but the White House delayed steep tariffs as trade talks progressed during the first week of the second quarter. Both sides are negotiating and working out details ahead of an upcoming summit with President Trump and Chinese President Xi Jinping. China’s Shanghai Composite index is up 27% this year, but still 13% off of their 2018 high point. On the fixed income side, yields fell in the first quarter greatly due to accommodative global central bank policies and investors looking for safe havens amid worries about Brexit and global economic growth. The higher demand caused increases in bond prices, boosting fixed-income investors’ portfolio values in the first quarter. * Each benchmark is allocated based on assumed Risk Profile of underlying indexes. **Benchmarks include a mixture of ICE BofAML US 3-month Treasury Bill Index, Barclays Global Aggregate Bond Index, Barclays US Aggregate Bond Index, MSCI EAFE Index, and the Value Line Composite Index (Geometric). 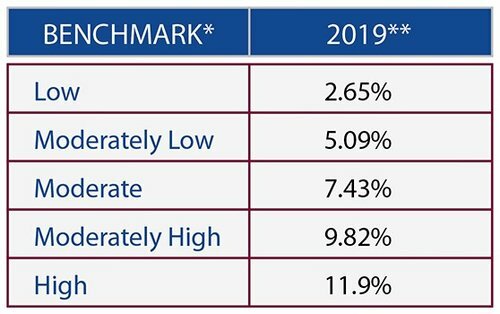 These benchmarks are the same benchmarks as those in the Risk/Return and Account Analytics sections of client quarterly performance reports. By comparing your portfolio’s return to the benchmark with the closest risk/return characteristics, you get a more accurate reading of portfolio performance than using a less diversified benchmark, such as the S&P 500 index. Since the Federal Reserve’s interest rate hike in December, the Fed has reversed course, indicating a far more “easy” or “accommodative” monetary policy stance during the beginning of 2019. This move was applauded by critics who thought that the December rate hike was a poor decision that could hurt the economy. Since then, the Fed stated they would pay more attention to inflation and economic data before raising rates. They now project zero interest rate hikes in 2019, down from two such hikes projected last December. However, there is still a disconnect between the market and the Fed. Markets have actually priced in a rate cut, primarily due to global growth concerns. Interest rates are the oil in the economic engine. Lowering interest rates boosts the engine’s horsepower or economic growth of the economy. That’s why the Fed reduces interest rates when the economy slows down. The market will continue to be very focused on statements and actions by the Fed during 2019 to determine what impact rates will have on economic growth. Another recent focus of markets is the interest rate yield curve and whether it has “inverted”. An inverted yield curve means that short-term interest rates are higher than long-term interest rates. Historically, an inverted yield curve means a recession is likely to happen in the future. There have been headlines that the yield curve has inverted, but the main interest rate spread barometer that people look at – the 2-year Treasury bond yield versus the 10-year Treasury bond yield – has not inverted. While an inverted yield curve is a possible recession indicator, it does not signal an immediate recession, but the possibility of one in the next 6-18 months. With current GDP, a dovish Fed and low unemployment, we do not see a recession in 6 months barring unforeseen events. We don’t see a recession coming in the short-term, but there have been recessions in the past, and there will be in the future. What can we do to minimize the damage to portfolios during a recession? The best answer is not to move to cash, which is a common reaction for many people. Instead, we recommend moving more into defensive investments – things people will buy no matter what, even in an economic slowdown, such as food, utilities, and pharmaceuticals. By moving into cash prematurely, you are not only on the sidelines during the economic recovery, but also during the lead-up in prices that occurs before the recession and corresponding bear market. For example, the S&P 500 has returned 41% on average in the 24 months leading to equity market peaks. 24 months after the peak, the return averages -1%. Trying to time moves in and out of the stock market generally leads to long-term underperformance. We work with our clients to find the right asset allocation that fits their risk tolerance and financial goals so they can stay the course during inevitable market volatility.